The Technart PC Engine (テクナート PCエンジン) JAMMA adaptor is a small PCB and associated cabling that allows a standard PC Engine console to be used in an arcade cabinet. It achieves this by amplifying the console's RGB for the arcade monitor, controlling the start button, and allowing either timed play per credit or simply allowing a coin to enable the start button. It also had a flashing screen and beeper to signal the approaching end of timed play. The specifics of its operation could be selected via the DIP switches. The following information is taken from the instruction sheet included with this PCB. There were at least two variations of this PCB, it seems, so this information may not be the same for your device. There is a little more information about this unit on the forum. There are three selecting mechanisms, labeled DIPSW1 through DIPSW3, though 2 & 3 are rotary selectors, not DIP switch arrays. DIPSW2 sets the timer game time in 1-minute increments. DIPSW3 sets the timer game time in 10-minute increments. There are five potentiometers on the PCB, to control the analogue outputs. Pot 1-3 control the red, green and blue output levels respectively. Pot 4 controls the PC Engine audio output level Pot 5 controls the 'coin in sound'. I think this refers to the 'please insert coin' beep that triggers when the timer is about to run out. There are two cautions (注意) included with the unit. 注意1 - Be careful not to use less than 5V. Ensure your 5V is adequate. 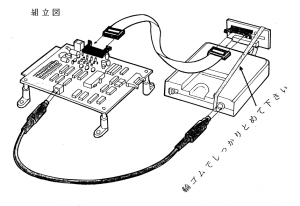 注意2 - Use the included rubber band to secure the PC Engine expansion connector as shown in the diagram above. This PCB uses a nearly-standard JAMMA connector. There are only a couple of changes, notably Player 2 Start and Reset. The rarely used counters aren't the same as JAMMA. The rest of the changes are simply things this PCB doesn't require. The specific details are below, differences from standard JAMMA noted with a *.